Primary grade students need access to technology and internet research in much the same way that their older counterparts do. However, we need to give them just a little more support, especially as they are mastering the important skill of reading independently. 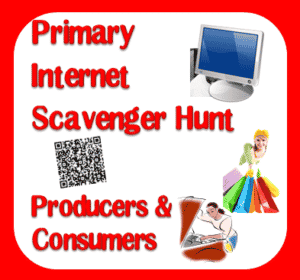 This Producers and Consumers Internet Scavenger Hunt was designed specifically for first grade students, with a QR Code option and games to build understanding. Download this free scavenger hunt from my Teachers Pay Teachers store.